Deputy Tony Lipps uses art as a de-stresser. He puts the finishing touches on a painting of Tyler Eifert, Bengals tight end. 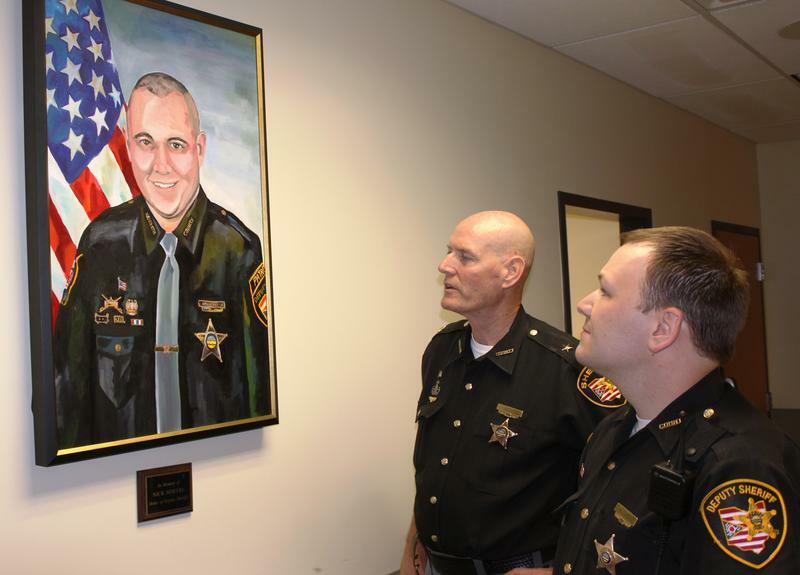 Deputy Lipps shows Sheriff Neil the painting of Deputy Nicholas (Nick) Hoevel which hangs on the wall of Patrol District 3 in Sycamore / Symmes Townships. Deputy Lipps says he always tells people he fell into police work after majoring in fine arts. "I don't mean it as a bad thing because I always compare it to a happy accident because I enjoy what I do." Painting helps Lipps get his mind off the difficult patrol days. There are similarities in police work and art. He says when it comes to police work, "You don't do it to catch the bad guy all the time, you always do it to help people." In art he is helping people too. When Deputy Roger Hinkel, a helicopter pilot, got sick with cancer, Lipps painted a picture to be auctioned. After Hinkel's death, Lipps drew a picture of him that now hangs in the Sheriff's headquarters. He did the same for Deputy Nick Hoevel who died of a heart attack. "I don't have a million dollars to donate to people, but I have my talent." Lipps' studio is filled with sports pictures he's painted. He is putting the finishing touches on Bengals tight end Tyler Eifert. Also displayed is a painting of Reds reliever Aroldis Chapman. His "Charlie Hustle" painting sold during the All-Star Game for thousands of dollars. "I wasn't exactly expecting to sell that. I put it at $3,000 so nobody would buy it, but it didn't work out. I mean it worked in my favor still!" Sheriff Neil said Lipps is one of many talented members of the department. Possibly selling himself short, Neil said his de-stresser is cutting grass.